We are seeing many more women farmers as we develop our commercial food processing operations at the Wisconsin Innovation Kitchen and elsewhere. There was a good article and photo essay recently in Modern Farmer Magazine titled 'Photographing the Female Face of Farming'. "...the number of women-operated farms had more than doubled between 1982 and 2007. If you add primary and secondary operators, women make up 30 percent of U.S. farmers, with nearly 1 million women working the land." 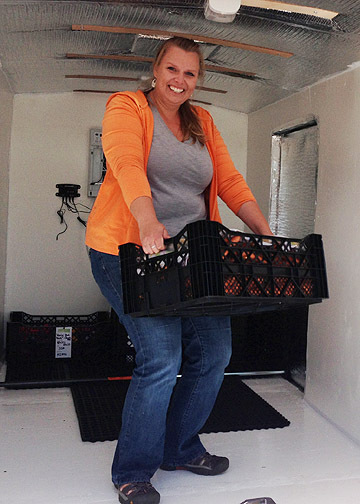 This photo is my friend Christine from Solveien Farm delivering produce to the Innovation Kitchen for light preparation and freezing for commercial markets. The Innovation Kitchen model is creating new and profitable opportunities for farms, food businesses and people who support sustainable food. Congratulations Christine. You're one in a million!